This week’s recipe has been inspired by my trip to the Philippines, after Olay introduced me to some amazing local food. I just had to re-create some of the delicious flavours. This is super easy to make and yet so tasty. ‘Adobo’, meaning sauce. If you have little ones in the house, perhaps make it using 1.5kg chicken breast or thigh pieces instead of a chopped whole chicken, so they don’t have to worry about any bones. You could use fish or even another cut of meat. 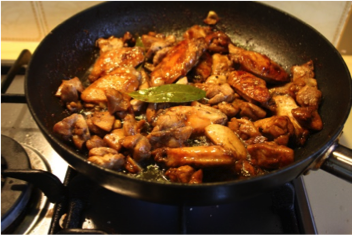 Heat oil over medium/high heat in a large frypan and seal chicken, turning it until browned on all sides. Add the garlic and cook for 1-2 min. Season with a little Himalayan salt & cracked black pepper. Then add the bay leaves, soy, water and vinegar, and sugar. Bring to the boil without stirring, and then reduce heat to low. Lightly cover and simmer for approx. 30 minutes or until chicken is tender, and sauce ‘Adobo’ has reduced by half. Remove the lid near to the end to allow this to happen. Serve with steamed rice (white or brown if you prefer) and steamed green vegetables (bok choy, choy sum).